Has anyone taken the research you’ve done about Doplar Radar and Eye Cancer in Huntersville NC serious? – I’m patient 17! They just had another one with OM in October 2017!!!!! FYI, I am also getting a lot of interest in my recent high voltage transmission line study in conjunction with the geospatial study supplied by others. We are preparing to do some testing in the area. Thanks – when I originally saw your comparison of power line setup’s between Huntersville and Auburn, I forwarded it to various contacts including Huntersville researchers, newspaper reporters, Facebook page owners etc. I appreciate you forwarding. Even though I spent two years researching the area along with the pulsed radar installation, the geospatial has me convinced it may be the UV radiation generated from the high voltage power lines. The problem may come and go depending upon maintenance of the lines, weather conditions and exposure time/location. I hope your health is doing OK.
1) Based upon the radar database I put together 3 years ago and observations of wildlife diseases I correlated vs. locations of radar stations, a university researcher is looking at human disease rates around similar radar stations (for the past 3 years), including your area. I am not sure when, but a peer reviewed research paper should be published looking at correlation strengths – I am not involved directly in the analysis. 2) I did have a request for correspondence from researchers in Philadelphia specifically about the Huntersville eye cancer cluster. 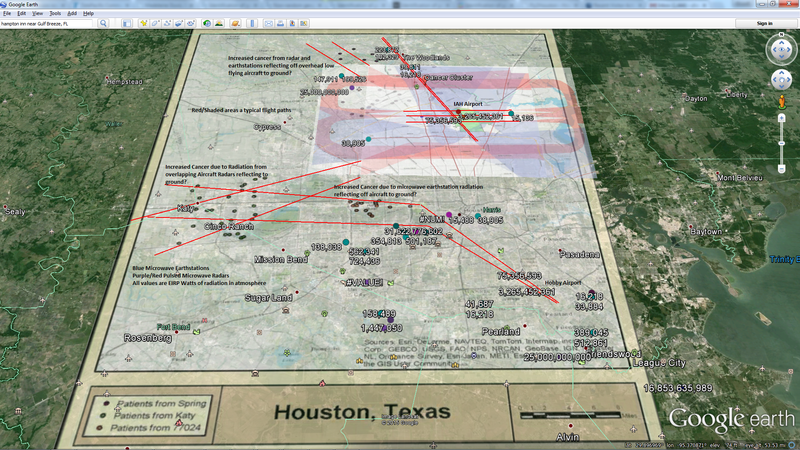 I shared everything I knew at the time about the radar/radiation in the area – that was over a year ago. 3) The radar operators did respond to my request to verify the radar was not striking a water tower as claimed on their website, and told me the beam was striking another microwave tower ~ 5 miles away and damaging it(which didn’t make me feel any better) which is why a slice is turned off toward the lake. Since the problem is with the eyes I remain convinced it may be a microwave radiation exposure problem in your area. Young females that spend extra time tanning in the Sun and looking up could have the highest exposure as well as others who spend more time outside or driving in the area.